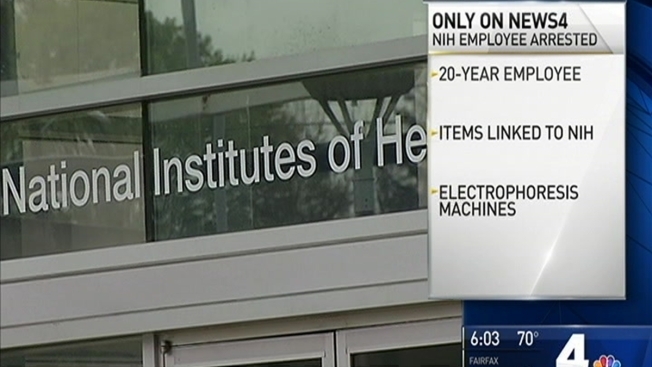 A longtime employee of the National Institutes of Health headquarters in Bethesda is under investigation for selling the agency’s medical research equipment on eBay. Scott MacFarlane reports. A longtime employee of the National Institutes of Health headquarters in Bethesda, Maryland, allegedly sold medical research equipment from the agency on eBay. Chris Dame is facing a charge of theft from the U.S. government, according to court records. Dame is a 20-year employee of NIH’s Medical Arts Division, according to court filings submitted by internal agency investigators. They said Dame worked as a “visual information specialist,” designing, photographing and displaying informational posters on its Montgomery County campus. Dame is suspected of selling a “large quantity of medical research equipment and office supplies,” including at least 14 items identified by an internal agency investigator, the court filings said. In his submissions to the court, the internal investigator said he linked Dame to an eBay user named “phodan0,” a user whose page had listed a number of items suspected of being taken from NIH headquarters. In his court filings, the investigator said NIH police identified a cache of equipment in a hallway storage closet linked to Dame’s alleged “phodan0” EBAY sales page. According to court records, among the equipment found were three electrophoresis machines, which are used to apply electric charges to molecules. A judge authorized federal agents to raid Dame’s home, car and storage units in January. According to an affidavit from a federal investigator, police “recovered several pieces of medical research equipment, some of which had NIH property stickers and toner cartridges. The toner cartridges match those used by NIH, and also matched cartridges listed for sale on eBay under the username phodan0.” Eleven other pieces of medical equipment were found in the storage units, according to the affidavit. A colleague who answered Dame’s work phone number said Dame was on “extended leave” from NIH.